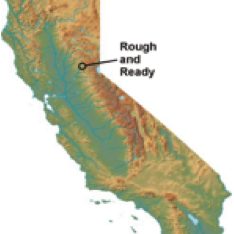 Rough and Ready is located in Nevada County, California, just a short drive west of Grass Valley. Rough and Ready provides ideal country living, and yet we are reasonably close to metropolitan areas. Our proximity to outdoor recreational activities seem to appeal to home-based business entrepreneurs and self-employed professionsals who, along with conventional working and retired families, now enjoy living in Rough and Ready. Rough and Ready has a population of 963 (2010 Census) and is proud to have an alert, responsive and highly skilled Volunteer Fire Department that operates with up-to-date fire fighting and rescue equipment. Rough and Ready's climate has summer high temperatures in the 80s and 90's and winter averages in the 40's. The average annual rainfall is slightly over 52 inches. With an approximate altitude of 1,885 feet above sea level, Rough and Ready is usually, as we like to say, "above the fog and below the snow!" Just 63 miles from Sacramento and 140 miles from San Francisco, Rough and Ready is conveniently located only 95 miles from Reno and 65 miles from the ski areas of Truckee. PHOTO ABOVE: Rough and Ready in 1857. 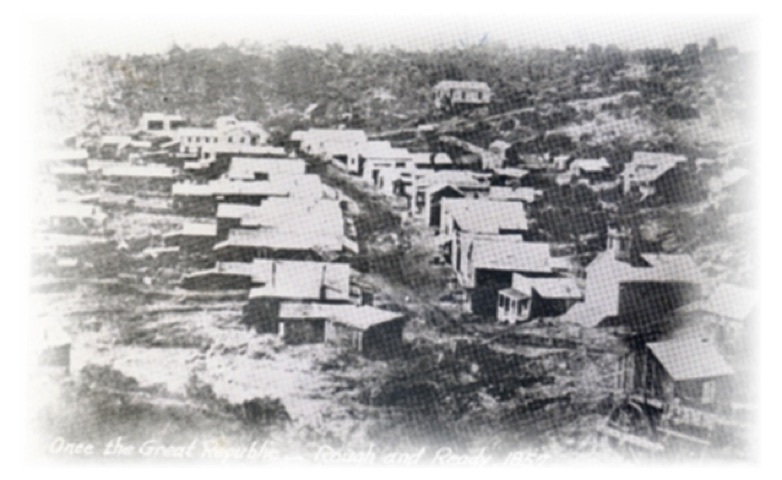 Notice the IOOF Hall (now the Rough and Ready Community Hall) in the upper portion of the photo. The Town That Seceded from the Union!